Atlantic Glass Studio is an exciting workshop and studio situated alongside the edge of the canal at Bude in Cornwall. 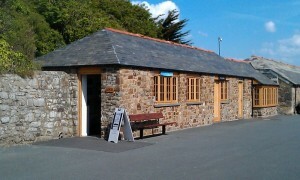 The 'Old Forge', which has been completed refurbished, most recently housed Bude museum (which is now located in the Castle behind us). In it's hayday the adjacent buildings housed the forge which supported the workings of the canal. Today it houses 3 studio/workshops; us (we are the one closest to the sea with the door facing the sea, NOT the canal); Acorn ish Studio, mixed media art; and Coastal Yarns, alpaca wool and knitting accessories. To find us, head for the Castle and with it to your right walk down to the canal (you can't miss it but don't fall in!, there is also the River Neet, the castle is inbetween the two, you can't mistake them, you can walk along the canal but not along the river (at that point anyway). When you get to the canal turn right towards the sea and you will find a row of low buildings on your right (canal on your left) and we are the last unit before the beach (hopefully this photo will help). We will soon have a new sign above the door and windows to help you, if we are open (and it isn't too windy) there will be a sandwich board by our door with our name on it. As mentioned our door faces the sea and not the canal which sometimes can confuse. Alternatively from the visitors centre car park, cross the road and walk along the canal with the Olive Tree to your right and the canal on your left. Soon if you type our name into Google it should come up with where we are on your mobile or tablet. There is plenty of parking either in the car park by the canal or behind the parkhouse centre (easy to find) and the whole Lower Wharf area is well worth a visit. 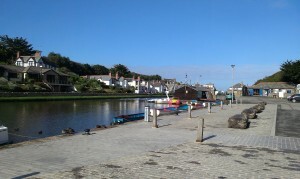 There is Bude Castle which now houses the museum and has art exhibitions, and also houses a tea room and gift shop; there are several other workshops by the canal basin, including Wharf Woodcraft, Three Bees of Bude, Kernow Fleece and Bleujen Florists, and between these workshops and The Olive Tree is a fabulous fishing tackle shop. From Good Friday to the end of September there is the Bude Farmers' and Craft market on the green by Wharf Woodcraft, every Friday 10 – 3 with stalls selling local produce and crafts. We also have a local convenience store and Post Office and Bude Library. In terms of food and drink, there is the Olive Tree restaurant and a snack kiosk and of course ice cream kiosks (some of these only open in the summer). You also have (just the other side of the canal) The Brendon Arms pub and The Falcon hotel serving great food and drink. You can also hire a rowing or paddle boat and explore the canal. There are ducks to feed and sometimes the Cormorant comes to sun himself and fish. You can also walk along the canal inland through the wonderful nature reserve and you just might catch a glimpse of our resident Kingfisher family.